Grav and I were exploring Hot Springs Village and its surrounds after shooting a segment for the upcoming AETN special Make Room For Pie in Hot Springs. We were on the hunt for agates, into which he'll etch historic designs he's researched and drawn. It was pretty warm and, after a four in the morning alarm and six in the morning crew call, I was starting to get sleepy. 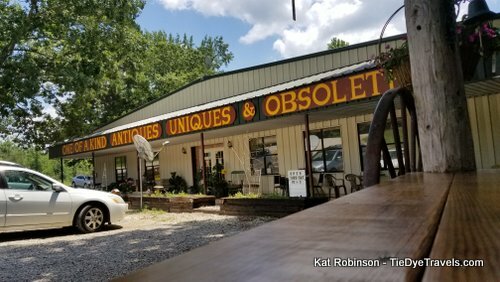 We'd already perused several rock shops and found many good examples for Grav to pick up at Jim Coleman's place between Hot Springs Village and Jessieville. We'd turned back, discussing what lunch would be and remarking to each other about this particular Friday being the anniversary of the day he first started shooting for me, seven years ago. As usual, we were dithering. Not far past the Walmart, Grav whipped his head around, looked back and forth and took an unexpected turn. I sat up - for once he was driving because I was snoozly - and looked around. Grav had taken a cut-off that was taking us past several home improvement shops, a curvy asphalt trail that curved around and up the side of the ridge. Now for some people, there would be questions, but for us? Maybe that's seven years of getting used to the unexpected. I looked around and just enjoyed the ride. 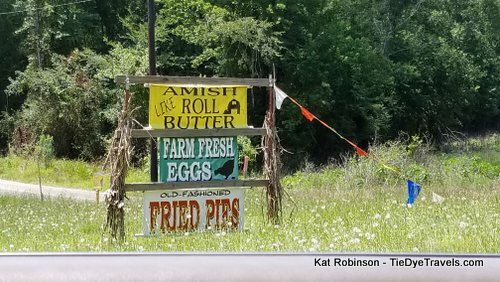 About a quarter mile down the road he turned in where three signs had been posted, advertising "Amish-Like Roll Butter," "Farm Fresh Eggs" and "Fried Pies." He pulled in at what appeared to be a relatively new building, One of a Kind Antiques, Uniques and Obsoltetes. Next to it was a tiny, adorable stand with some outdoor seating, a food trailer with a built-on rough-hewn porch. We decided... to go check out the antique mall. Because we were there, that's why. Inside we looked through booths of art, collectibles and this and that. It wasn't quite full yet - a sign of a new operation, but all of the booths were clean and freshly painted. I kept noticing people walking by with bowls and spoons and listened to people chat about their lunches. Up front, half a dozen were milling around a kitchen area with their bowls and wrapped sandwiches. It looked like a good sign. We usually take longer in these sorts of malls - I'm driven by a curiosity to see everything and Grav looks for things he can art with - but we glanced at each other and he motioned us outside. Once through the doors, he confessed. "Whatever they're eating looks really good." "Someone said something about beef brisket." I nodded at him and we walked over to the stand. There was a lady pulling items out of the back of the van next to it. She was selling smoked chicken and fresh eggs, and asked us if we'd had lunch yet. "We may now. 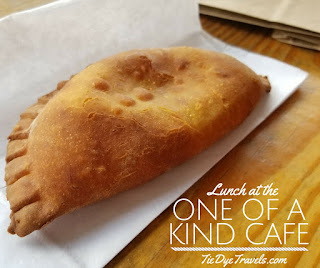 I saw the sign for fried pies," I told her. "Oh, you'll like them. They don't have any chemicals in them. Flour, eggs, butter and coconut oil. You really need to try one." I wasn't certain if she recognized me or not, but that was okay. I was intrigued. Grav and I wandered over and stared at the whiteboard. We're on a budget right now and were debating which sandwich to share. Yeah... that didn't happen quite the way we expected. 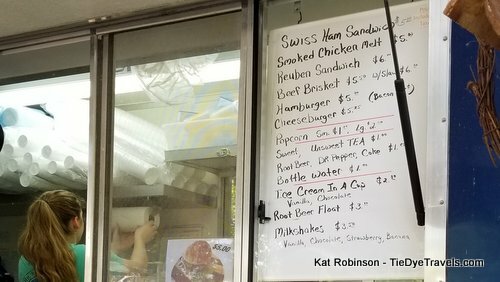 The prices for the sandwiches were very reasonable. While the red beans and rice looked tempting, it was hot, and I knew we'd be back on the road in a few minutes, so it wasn't really in consideration. The beef brisket, however, was, and I knew I wanted it. Grav, on the other hand, was all about that chicken. We eschewed the sides and decided to share a fried pie betwixt the two of us. Our order placed and paid for, we sat on tractor seats on stumps - the converted "bar stools" for the double plank that made the counter for this cute little stand. The temperatures was pressing 90. The humidity, like most Arkansas summer days, wrapped us up in wet blankets of moist. But I caught Grav grinning. We've been so involved in our new ventures lately, it was good to just go out and find a new spot like this. This is what we enjoy, what we do. Didn't take but a few minutes to set us up - after all, that chicken and that brisket had already been smoked. Grav took the bag offered through the window, and we started unpacking it and taking our photos right then. I didn't have to turn around to know we were being watched. It took a couple of minutes, but we're used to this. Then we dug in, claiming half of each sandwich as our own. The brisket... well, it was different. 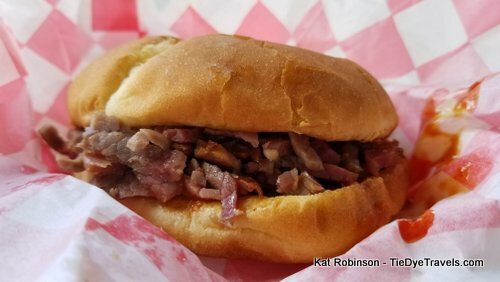 The beef was nicely smoked, but it was also cut in a way I had never encountered, sliced brisket chopped very precisely to create strings of against-the-grain beef. Paired with a cloying sauce, it came across tangy and smoky but with a more solid mouth-feel than I am used to in smoked brisket sandwiches. 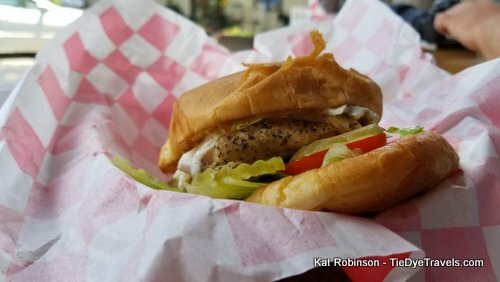 It had been served on a soft yellowish bun, which also attributed to an unusual mouthfeel. Overall, it worked and I enjoyed it. The smoked chicken, though... whoa. Served with swiss cheese, lettuce, tomato, mayo and pickle, this nicely composed sandwich was a winner with both of us. Black pepper could have dominated the filet of chicken breast but instead it only enhanced what tasted like a hickory and oak smoke. I briefly considered purchasing some of the smoked chicken breast to take home before remembering we were staying another night at the Arlington, in a room without a refrigerator. I made a note for later. Grav begged the rest of the chicken sandwich. I grinned and turned my attention to the apple pie. 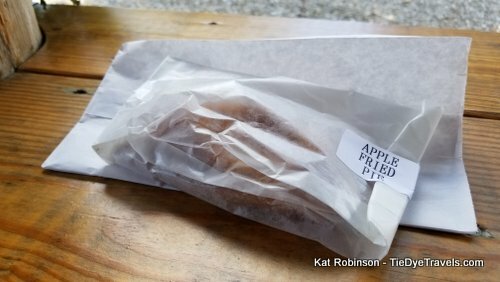 This particular apple pie (we'd also had peach, cherry and apricot to choose from) had a crust that was significantly different from what I've encountered elsewhere. It wasn't pocked from deep frying or particularly blonde or crispy. In fact, it looked far more baked than fried, and had a biscuit crust appearance. It looked, frankly, rather neat and composed. 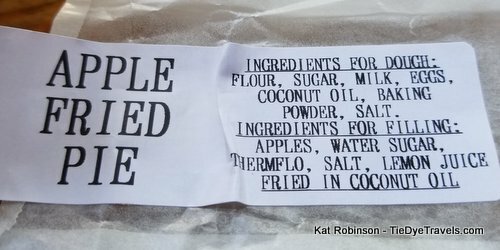 Within, however, were some of the softest apples I've had in a pie. As in disintegrating on the tongue apple. Lightly spiced, barely sweetened, these apples were, honestly, apples - fresh, recently picked apples that tasted like apples. What I mean to say is, this was no pie filling out of a can, but a home-stewed filling. 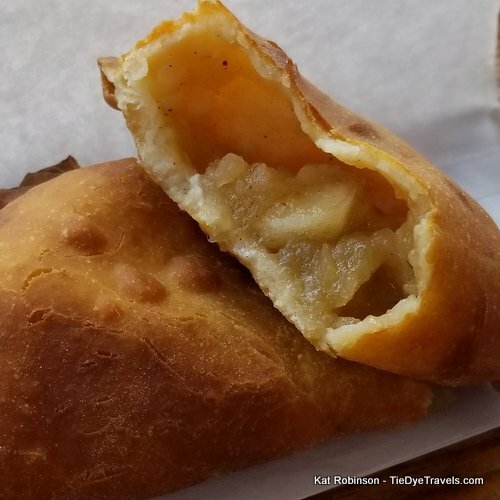 The apples were mild, not tart, and the effect with the soft crust was almost like homemade apple butter on biscuits. Grav claimed most of the pie, too. As I mentioned, it was hot and I was sleepy, and after that repast a nap was in order, so we wandered back to the car and Grav took us back to town. A little digging later on turned up more information about this place. The One of a Kind Cafe has been open about two years. It's run by Trish Phillips, who's very much involved in the organic farm-to-fork movement. The property is the location for a farmers market, and the dishes served at the cafe are from these products. 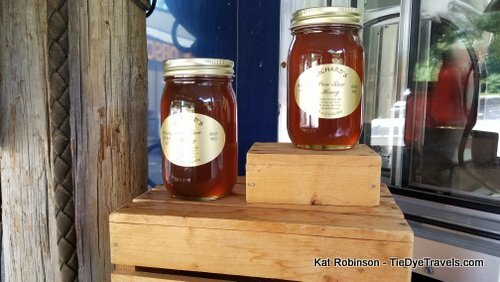 I had noticed locally-produced Richard's Honey while I was there, and I was thrilled to discover the cafe's emphasis on fresh local products. And I kicked myself a little after reading about the cafe's Reuben sandwich, which is the specialty. So yes, a revisit is in order next time I am in the area. That shouldn't be too long from now - Grav needs to keep resupplying himself in agates and we both need to bring more stuff down to All Things Arkansas. And to think, we wouldn't have experienced any of this, had he not followed a sign off the highway. Curiosity has its rewards. 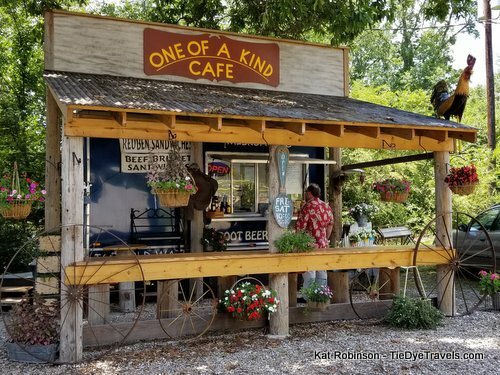 You'll find the One of a Kind Cafe at 372 East Glazypeau Road southeast of Hot Springs Village. Give it a shot, and check out the spot's Facebook page. It's currently open 10 a.m. to 5 p.m. on Fridays and Saturdays. 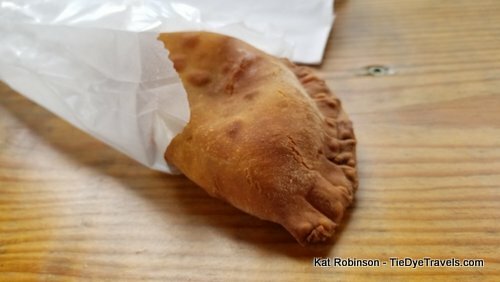 Oh, one more thing - the ingredients list on that fried pie? Trish, is very fussy about all the ingredients in her food. The café is always kept spotless. Her food is excellent and her prices are kept as low as possible. It is worth a ride to go to One of a Kind Café. Wait until you have one of Trish's big, fat, juicy cheeseburgers! They come loaded with the best beef, good cheese, and fresh goodies and they are delicious. Again, the fresh farm tomatoes, onions, lettuce, etc. combined with fresh, prime beef result in a very tasty cheeseburger. It's the best and it's a darling place! Did you buy anything from the vendors inside the building ? Not on this particular trip, though there was a really neat Art Deco necklace I had my eye on. That Richards Honey is all over the state as local and also in Memphis. I can by it at the Rogers farmers market from a lady that said it belongs to her brother but can't tell me how many gives he has or where they are. So I have questions about Richards Honey.And it is getting to be more questions than answers or true from them.